The Fellowship was fortunate enough to obtain a copy of JOE FRANKENSTEIN #1 from IDW Publishing. Graham Nolan and Chuck Dixon write, with art by Nolan and colors by Gregory Wright. Teenager Joe Pratt is on a losing streak. He has lost his job and his girlfriend, and he’s pretty much losing at school and at home as well. But on his last pizza delivery he meets a very large dude who saves him from the vampires about to feast on him. The big guy tells Joe that he’s the last scion of Victor Frankenstein, and that he’s being hunted. The big guy is none other than Frankenstein’s monster, of course (he prefers “creation”). And poor hapless Joe is now in way over his head. 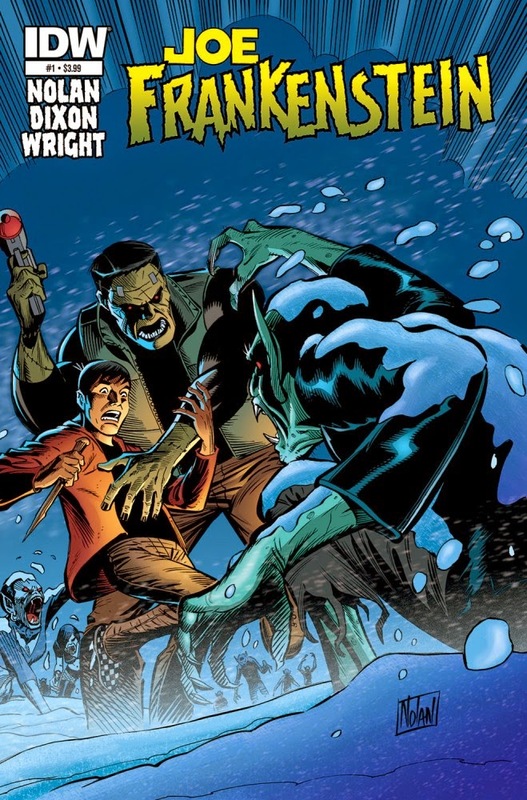 It’s an imaginative twist on the Frankenstein legend, though, with the monster as defender of the family. The story also has its exciting moments, and the art is nicely detailed with great face work. I really like how the coloring seems to blend the classic horror movies with bold “four-color” flashes. So if comedy/horror/adventure is your thing, this book was made for you. If you’re only into one of two of those things, don’t worry – you can still pick it up. JOE FRANKENSTEIN #1 is available now at your FLCS or at idwpublishing.com.